Hi, I am interested in your 1969 Chevrolet C/K Truck (stock #4683-ATL) listed on Autotrader for $24,995. I'd like to get more information about this vehicle and confirm its availability. Sporting a very cool two-tone color scheme and a number of inspired modifications over its classic form, this 1969 Chevrolet C10 454 just flat out looks like it means business. The fact is, it does - theres an expansive big block rumbling away under its hood thats standing by and ready to propel this pickup like a rocket. Add to that its overall exceedingly strong running condition and you have a rare opportunity on your hands here. This Chevy sports a color combo that really suits it well. Up front, a pair of broad red stripes run the length of the hood while passing over an aggressive looking scoop and are surrounded by silver over the balance of the hood, cab and upper bed rails, which really accentuates the dimensions of the long bed area. Theres no doubt that its already a head-turner of serious magnitude in its present state, but a freshening up of its paint will elevate its appearance to a whole new level. Whether you opt to drive it just as is - certainly a solid decision itself - or make that trip to the paint booth, theres a lot to like here. The overall body alignment looks strong, with that cowl hood blending in nicely with the panels to either side of it, and a cabin that lines up well with the bed in back. The frenched drivers side antenna provides a nice touch of customization, as does the deleted tailgate in back, which allows you to see the finishing handiwork that went on inside the bed area. There are some great touches on display inside the doors. A pair of late model buckets replace the original seating, wearing fresh-looking black covers with contrasting gray accents that look to be very well fitted and in clean shape. Just beyond the aftermarket steering wheel, the dash area has seen a revamping that shows a lot of skilled craftsmanship, with an assortment of white-faced aftermarket gauges recessed seamlessly into a custom instrument bezel and a fuel pressure gauge perched at the center. The carpeting below looks to be in very solid shape and the vacant position for the stereo system looming above the ratcheting Hurst shifter affords you the opportunity to finish off this classics audio system just as you see fit. Come around to the back and youll appreciate the details on display in the bed area, where a sizable fuel cell and battery box have been installed inside the modified inner walls, one of which bears a recessed Chevy bowtie - a great finishing touch. C10s of this era featured sizable engine compartments, and the one here is ably filled by an expansive 454 cubic inch V8 that provides all the go-power you could want, with an estimated output in the neighborhood of 600 horsepower - plenty to propel even this substantial truck like a rocket. The big block features a Weiand aluminum intake and a Holley 4-barrel Demon carb and has been dressed with a pair of sharp looking chrome valve covers and a matching compact air cleaner and exhales into a pair of headers leading to a dual exhaust with cutouts to amplify or subdue its fearsome note as you see fit. The 454 pairs with a rock solid 3-speed TH350, while a sizable radiator with dual electric fans has been added to the mix to keep temperatures in check. This ultra-powerful classic truck rolls on a set of 15 aftermarket steel wheels wrapped with Cooper Cobra Radial G/Ts in front and massive, asphalt gripping 325 tires in back. Classic looks, with just the right amount of customization, combined with unparalleled power to knock you back in your seat. 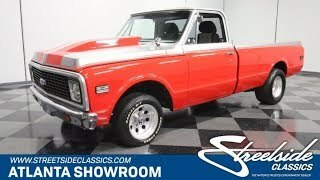 This 1969 Chevrolet C10 454 is a must-see. Call today!